There was a time when rock by bands like The Calling was being played alongside Westlife ballads and A1’s pop songs. The era was reminiscent of actually tuneful songs instead of just heavy-thumping beats, but unfortunately this phase faded to make way for the dominance of hip hop and R & B. For fans of modern rock a few years back, Blackbird will really bring back the memories of guitar shreds and power rock ballads. For the clueless who have always thought Alter Bridge and Creed were the same band, well, they’re not. But don’t worry, it’s a common mistake as both bands aren’t that different. Here’s the explanation: take Creed, a rock band which used to be very popular during the end of the 1990s and beginning of the 2000s, remove notorious lead singer Scott Stapp (who broke up the band single-handedly with his horribly big ego, among other things) and insert new lead, Myles Kennedy, ex-lead singer of The Mayfield Four, and you have Alter Bridge. When the band first started, the new lead vocalist’s distinctly different voice managed to change Alter Bridge’s music to the extent of successfully separating the band from Creed, but these were just the vocals. It was harder for the 3 other members to create a new style and push aside the one that they had been so familiar with. One of their 1st singles, ‘Open Your Eyes”’ sounded like it could have been Creed itself. In fact, “Open Your Eyes” featured the same guitar work as one of Creed’s songs, “My Sacrifice”. The rest of the band’s songs didn’t fare any better with many unhappy Alter Bridge fans being bothered by this comparability. 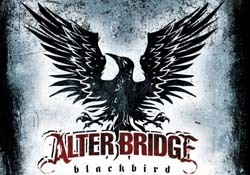 But it seems that Alter Bridge is safe with its latest album offering, Blackbird, boasting a less mainstream, more mature and remarkably different feel. Finally, there are no Creed-like melodies on this album and thankfully as well because Alter Bridge probably wouldn’t have survived if they released another repeat of One Day Remains. Without a doubt, impressive signature guitar solos are a staple throughout the album but the melodies and arrangements of the songs are what have set the band apart as one with their own identity. The album opens with “Ties that Bind”, a hard-hitting song that really serves well to set the tone of the entire album. Completely unexpected and a punch in the gut, the decision to begin with this track was a good one as it prepares the listener for what’s to come and strips away all Creed comparisons. The next in line is “Come To Life”, a more radio-friendly number next to the other borderline metal tracks. Others like “Rise Today”, which is their current single, “Before Tomorrow Comes” and “One by One” are also part of the set of mainstream songs offered on the album and would probably appeal to the masses much more than anything else available on Blackbird. What’s even more surprising about the album is its namesake. 8 minutes long and fortunately not dragged out at all, the song that boasts a wonderfully haunting melodic tune that resonates throughout the listener’s mind is about a lost loved one. “White Knuckles” and “Wayward One” seem to get lost at the end as by the 11th song, we’ve heard all we need to hear. If there were more variety in the tracks, maybe we wouldn’t get bored by the end of the album. With the release of Blackbird, Alter Bridge has recreated their image and their sound. To some extent, it even seems like this is their first rather than second release. If you’re a Creed fan and you’re looking for an album to bring back some of the Creed flavour, buying this would be big mistake. However, if you’re after a brand new modern rock sound with a bit of a metal edge, this is definitely an album to consider. UrbanWire gives Blackbird 3.5 out of 5 stars.